Sometimes being at work pays off. I was driving around doing some patrol when I found myself on a road that used to be in my zone. Something was different though. I passed by a barn that I had thought about photographing before years and years ago, but never really liked how it looked. This time there was an addition that I had not seen before. I was pretty sure that there was a Ford pickup parked in front of the barn, and I'm pretty sure that there was an American Flag on the front of the barn. I had to turn around to be sure. Yep, I had seen what I thought I was seeing. The truck wasn't exactly what I would want to photograph since it was actually in pretty good condition. The barn wasn't exactly what I wanted to photograph since it seemed a little plain. However, both of them together, tied in with the flag made for a scene that just screamed Americana. 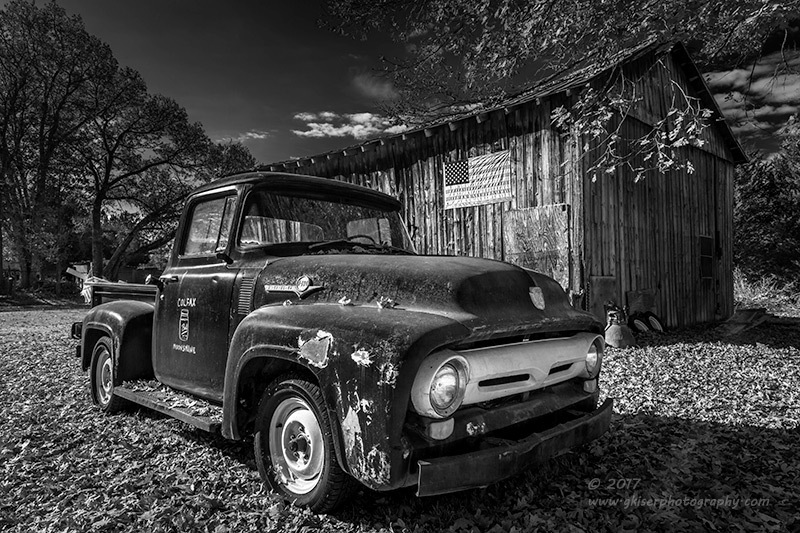 I drove down the side road to see what was around, and to see if I could figure out where the owner might live. I couldn't really make out the indication of ownership, but happened to see a man coming from the mailbox near the main road. I drove up to him and introduced myself. 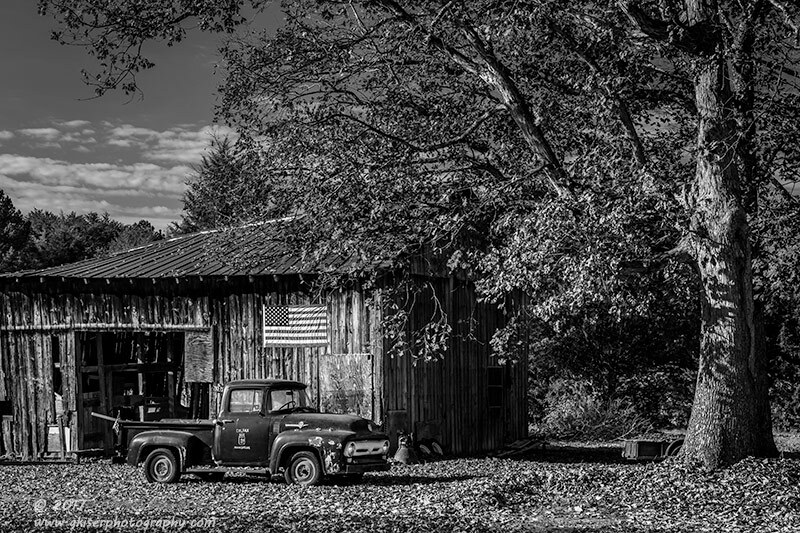 I explained that I was trying to find the owner of the barn and truck to ask if I could photograph it at some point. As it turned out, he was the owner and gladly gave me permission to photograph it. Since I was at work, I told him I would be back at a later time to give it a try. I was thinking the following weekend, but as luck would have it, I had a community function on Thursday that was going to cause me to work late. There were supposed to be clouds developing during the mid morning that were going to provide the light that I was most wanting to work with. However, as the morning progressed, the clouds never really showed. Before the warm light of early morning went away, I made my way out to Greensboro and got set up at the barn. The sun was already pretty bright, but it had cleared the trees to the East allowing the truck to get full light and not just patchy highlights. 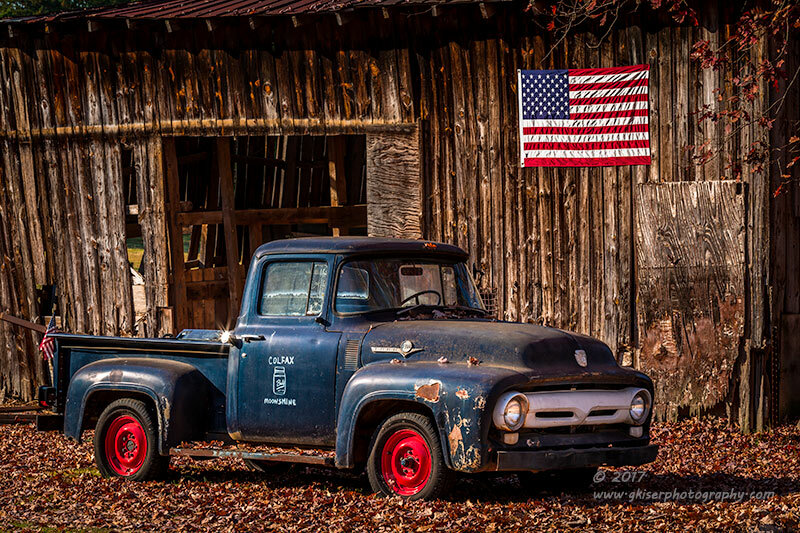 There was still a little bit of color in the tree above the truck which I thought was important for many of the compositions. This was why I didn't wait for a better weather day honestly. 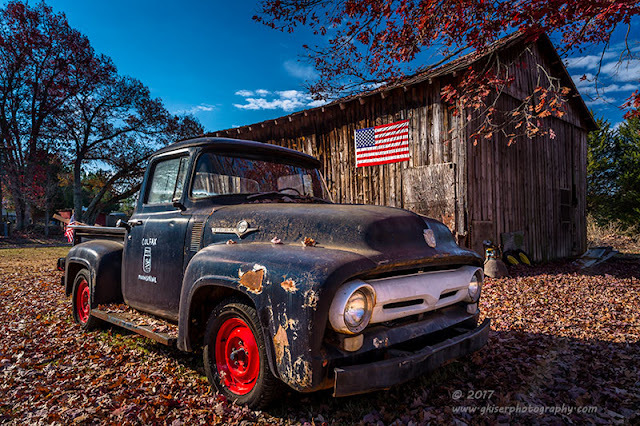 I would have all winter to shoot the truck under different skies, but the tree would be rid of all of the leaves by the end of the week. Looking at the scene, I was able to shoot from anywhere, but since the sky wasn't all that great, I didn't care to go overly wide in focal length. Instead, I opted to keep my 70-200mm lens on the camera and added a color combo polarizer to bump up the colors and contrast. I started to frame up different compositions with that combination and found that to be the idea setup for the conditions I was shooting in. I tried lots of different combinations with the primary elements of the truck, flag, and barn. The idea was to have them all work in unison. One of the compositions that I did worked out the issue of the rather bland sky by omitting it completely. 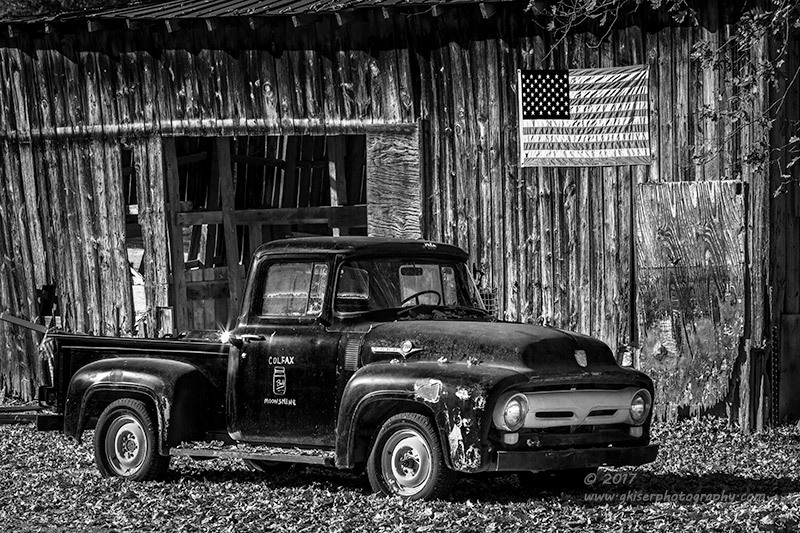 The barn became a backdrop to the truck, and the flag took care of the negative space. In that particular composition, I was at the perfect angle for the sun to be reflecting heavily off of the gas cap. I tried to avoid the reflection, but in the end decided to embrace it. I dialed in a narrow aperture to get some nicely defined light bursts from the cap. I figured that would help draw the attention to the door art which somehow really fit this scene. I then moved in to look for emblems to photograph. Unfortunately, I wasn't able to come up with many compositions that I really liked. In fact, I found no emblem pictures with this truck. The patina wasn't quite aged enough to really make the emblems stick out. I tried some other isolations with similar results. It would seem that with the current conditions, I was pretty much left with overall compositions with the three main elements. Just to round things out, I swapped over to my 24-70mm lens to get a little different perspective on the truck as well. Considering I had only about an hour and quarter to work the scene, I somehow managed to get 27 images. Of these, I found these three that I thought had merit to stand on their own. They are fundamentally different compositions, and I like each of them. The red, white, and blue theme carries through from the flag to the truck, and then to the sky with the leaves. Artistically, there is a pretty good balance here with the colors. After having a day to sit on these pictures, I decided to give them a shot as black and white to see how they would turn out. With the truck being a very dark shade, I didn't hold out much hope, but in the end, I was actually pretty happy with the conversions. It is actually Thanksgiving Day, so I should probably say "Happy Thanksgiving!" The truth of the matter is Toni is at work, and it just isn't feeling much like a holiday without her here. Since she was going to be gone all day, I decided to be a little productive and go out and try to get a few pictures. The weather was supposed to be clear and cold. I wasn't going to do much with landscapes with that kind of forecast, so I decided to go and hunt some Old Iron instead. I got up when Toni left the house at 5am, and headed out to Yadkinville, NC, where I was hoping that an old Plymouth was still sitting. I had visited it two or three times in the past with varying degrees of success. I wanted to get out there as first light was hitting so that I could get the warm sun on it, and avoid the bright undiffused sun of daytime. While I was driving, I was looking in my mirror and saw that there were actually clouds in the sky. There was an opening near the horizon as well. It was shaping up to be a great sunrise from what I could see. The problem was, I had nowhere to shoot it from. I had to enjoy what turned into a fantastic sunrise from the mirrors of the truck. Oh well, my intention wasn't to go out and do landscapes today anyway, and I still got to enjoy the sight. I arrived at Tommy's Garage shortly after sunrise and was happy to see that the car was still there. The problem that I was facing was it was sitting next to a late model Chevrolet, and Oldsmobile. I was going to have to get creative with how I shot this car. I had already planned to shoot isolations of the emblems and chrome. However, the car was in much worse shape than I had remembered which made it difficult to get in to find great details. What used to be a pretty straight front end had been torn apart. 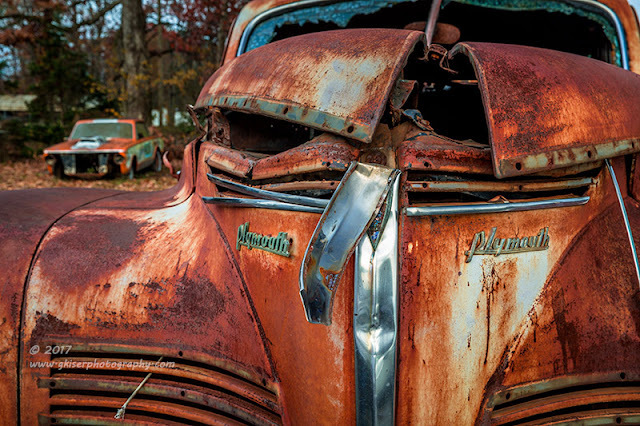 The hood was now split in half, and the chrome trim on the grills had been removed. What chrome was left was torn from the front and bend down. At least the "Plymouth" emblems remained for a focal point. 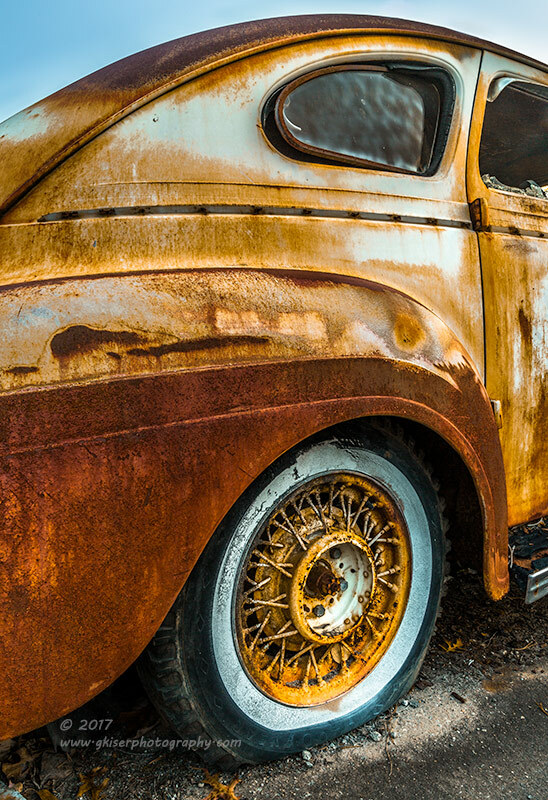 The patina of the car was still very nice and worth playing around with. I was able to get a few view of the front of the car as the sun was still low, and behind the clouds. One nice addition to the lot that had not been there before was an old Chrysler drag car called "Baby Hemi" next to the trees. 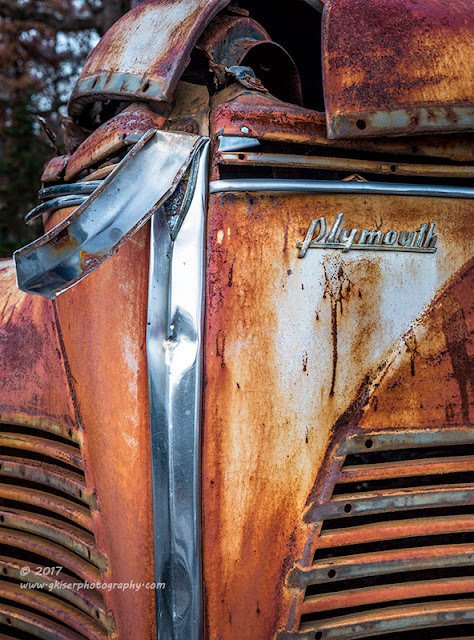 As I was composing shots on the front of the old Plymouth, I couldn't help but include the little dragster in the back. It was almost like a generational comparison between the two. It interested me, and gave something to put in the empty space in the upper left of the image above. I liked it so much I used that little car once again for a supporting role in an intimate capture of the antique. This old Plymouth has always fascinated me with the classic lines. The front end has been my focus for years, but today it was the rear that caught my eye. I liked the lines and the curves of the rear end (and yes, I know what you are thinking right now). What can I say, I enjoy some curves. An added element that was present on the rear of this car was the wheels. 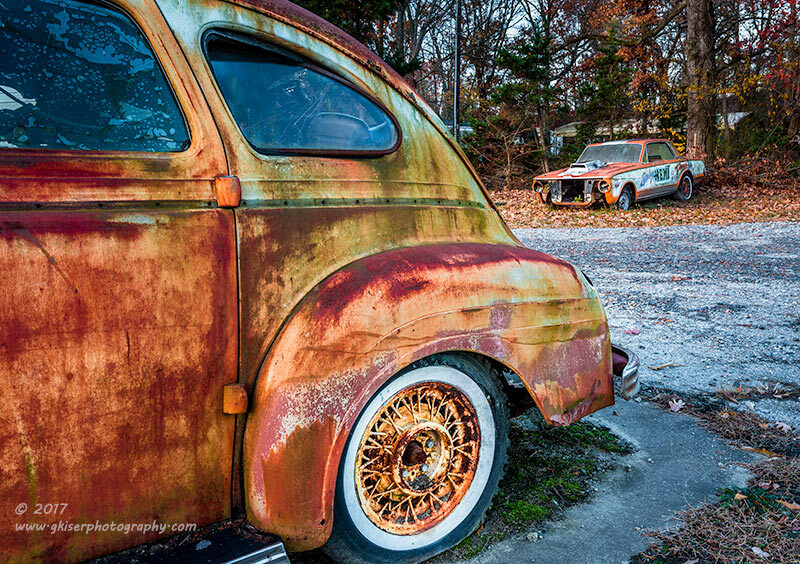 These were intricate spoked wheels with plenty of patina to match the condition of the car. The whitewall tires were period correct, and also helped to balance the color tones. This is the first car I can think of that I wanted to use the tire and wheel as a focal point in so many shots. It just played along so nicely with the flow of the design. Like I said, those wheels and tires really set the lines off on the rear of the car. The soft angles, the matching patina...it all just worked together. For a little touch of character on the right rear quarter, the side window was rotated slightly out of the closed position. That window shared lines with the roof, and helped to make the whole image flow. At first, I was wishing that the sky had been cloudy for this shot, but decided that the blue tones were very much needed to balance the overall warm tone of this image. As I was wrapping up the morning, I went to the rear of the car. I didn't find any emblems or adornments that I really liked back there, so I started to look at the lights. There were some interesting lines present that framed the remaining lights on the passenger side. I started to work out a composition surrounding those lights. I decided that I needed to include the bumper as a visual frame to the bottom. 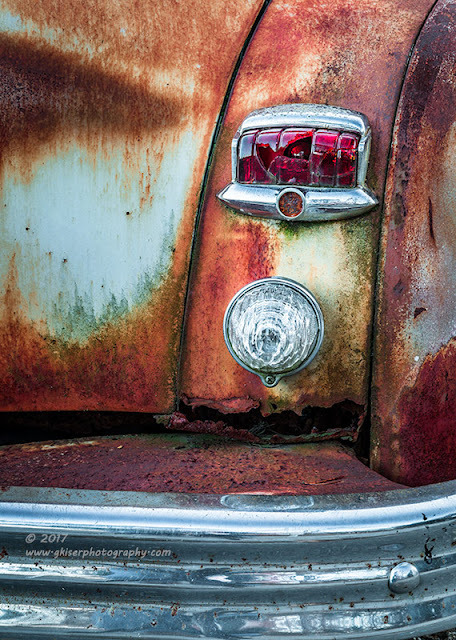 The vertical lines of the body and trunk lid helped to frame the lights, and the patina took care of all the negative space. After about an hour and a half, I had hit all of the areas that I thought that I could. 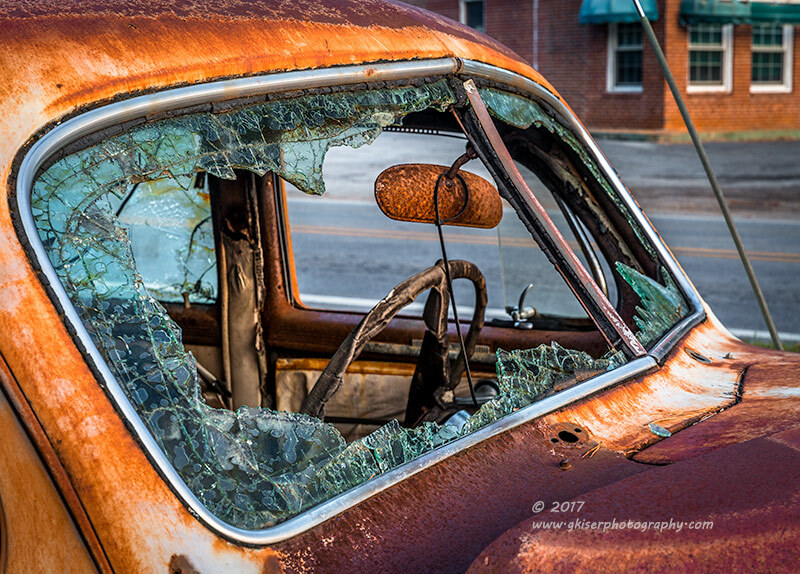 As I was packing up, I decided to try one more composition looking through the windshield. It was helpful that the glass was mostly gone, leaving a nice broken frame to work with. it was a different image than I usually capture, but there was something about it that I really liked. It was odd enough that it didn't make my first round of cuts, but as I was looking back through the 51 images that I had shot I had a change of heart. It was good enough to be one of the seven that I deemed good enough to be keepers. Considering it was a day where I just went to get a few emblem pictures, I ended up coming back home with a lot more. I really do like this car, and I'm glad that it still sits there. I don't know how much longer it will be though, since it is pretty much a rusted shell at this point. At least I've had plenty of time to play with it on many occasions. I had just finished up with my sunrise shoot at Salem Lake and had decided that I wasn't wanting to spend the day there. I had been paying attention to the weather since late Friday night and knew that the clouds would be hitting the mountains around 10am or so. I wasn't sure how thick the clouds were going to be, or if they would be of good quality for some grand landscapes. Simply put, I didn't have a clue what I was going to be able to shoot with the clouds that were coming. I had been to Stone Mountain and Hanging Rock recently, and at this point, I am a little tired of the Blue Ridge Parkway. I wanted to do something a little bit different with my day. 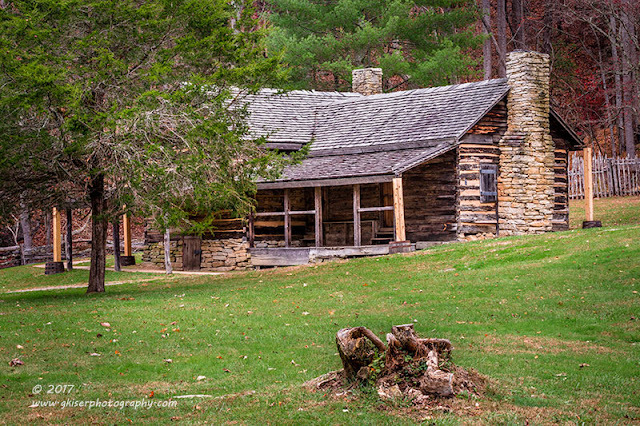 I had thought about going to South Mountain State Park, but had no idea what I was wanting to shoot there. I just knew that I wasn't going to mess with the main waterfall since it is one of my least favorite ones to photograph. I had about two hours to consider it because I found myself driving West with South Mountains as my destination. As I was making my way to the mountains I was looking at the sky. Unfortunately, it was a lot more sunny than I was expecting, and I wasn't seeing much in the way of interesting clouds. I really thought about turning around, but there was something in the back of my head that said to keep going. Over the years, I have come to learn to listen to that little voice in my head. It will come up with random ideas for destinations and I have no idea why I want to go there. Then it will push me to continue going even when I start to get discouraged over the weather. I even remember having the conversation with myself somewhere around Davie County that I don't know why I'm going, but something there was calling my name, and I needed to see this Trek through. When I arrived at the park the sky was nearly clear and what clouds were there were thin and weren't going to off much in the way of shade. I thought about going on one of the trails leading up to an overlook that I had never been to before, but thought against it. Something in my head was telling me to go down the High Shoals Waterfall trail which I had been down every time I have come to this park. It follows the Jacob Fork Creek and was well in the woodland. This was a concern because the sun was quite bright and not conducive to moving water photography. But that voice in my head was saying get on the trail!! I need to get my meds adjusted I think. I'll put that on the list for later this week unless I disagree with myself. I started off walking down the trail and was happy to find that there was still a good deal of color in the trees. I had expected them to be nearly bare by now, so I was getting a little excited. I also found that the light was pretty soft for the most part as the thin clouds were diffusing the light fairly well. There was actually a good chance that I could get some water pictures, or some woodland shots. The first area that caused me to stop was a fork in the creek, so to speak. The voices in my head like to rhyme it would seem. I've shot this section a couple of times with a wide angle lens. Today, I decided to get a little more intimate with a particular section of the creek. I started to compose around a pair of cascades and found that the compositions were just not compelling at all. They didn't capture what I was seeing. It was the addition of the yellow leaves hovering atop the cascades that were driving my want for a photograph here. I flipped the camera on its side, still fitted with the 70-200mm lens and a Singh Ray Color Combo Polarizer. I was able to get into position on a rock (didn't have my tall waterproof boots on) and capture the bits of color above the cascades. As I was fine tuning the composition I knew I was onto something. The images that I was seeing in the LCD were conveying exactly what I saw with my eyes. I was looking up into the sky and seeing blue skies, but for some reason the lighting here was perfect. The water flow was nice, and the wind was relatively calm for the moment. The little voice in my head was saying "I told you so!" Yeah, there was obviously a reason for me to be here and it was working out well. It was time to sit back and embrace it. Oh wait, I can't sit back, I have to work the camera. Since I had my long lens on, I knew that shooting intimates of the cascades would be a good idea. I turned my attention to the right and found a nice section of rocks where the water was washing over them. I got the camera into position and cropped in tight to the rocks. I tried a couple of different compositions before settling on one. 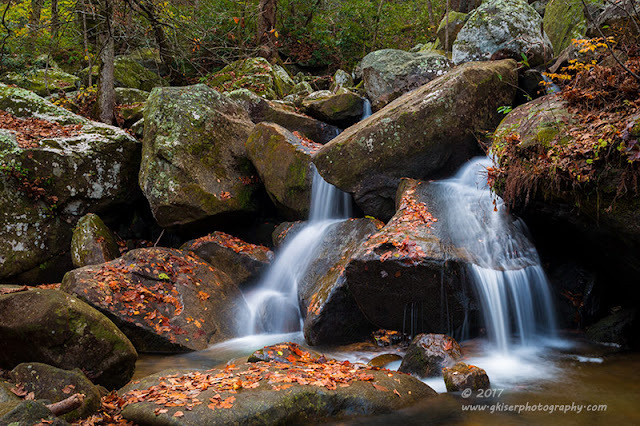 There was a nice balance to the image, and the water was nice and soft as it flowed over the rocks. Before I packed up the camera I looked for some more compositions. 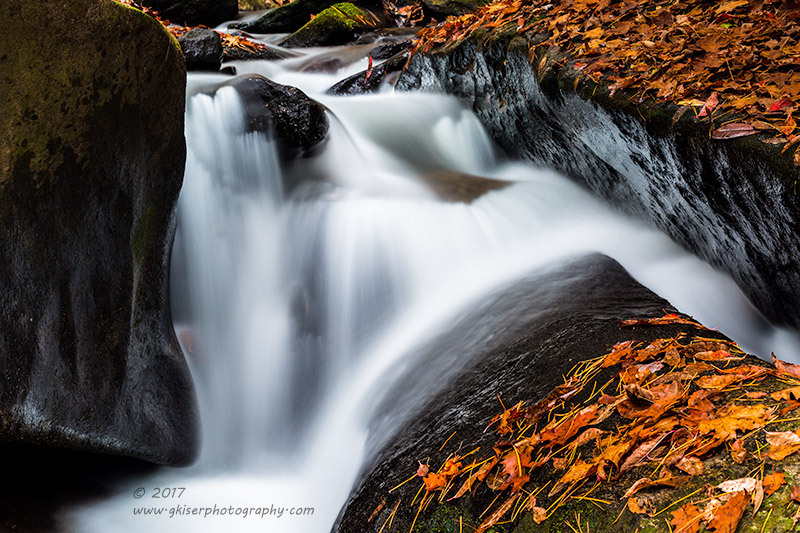 I started to shoot the branch above the cascades, but when I got home to look at it, I decided that it really needed the context of the creek below to make a compelling image. The handful of shots that I made of the branch were ultimately tossed in the bin and weren't worthy of keeping. As I worked my way along the trail, I cam upon another section that I have photographed several times before. The star of the scene has always been a tree that looks like it is yawning in agony. I wanted to try my hand at photographing it again, but there wasn't any color in close proximity to it, and it wasn't a pronounced at it needed to be. It was, however, still interesting, and worthy of being in a composition. I decided to look big instead. I grabbed my 24-70mm lens and added the the Singh Ray Polarizer again. After a bit of rock hopping, I was in position to shoot the composition that I had in mind. 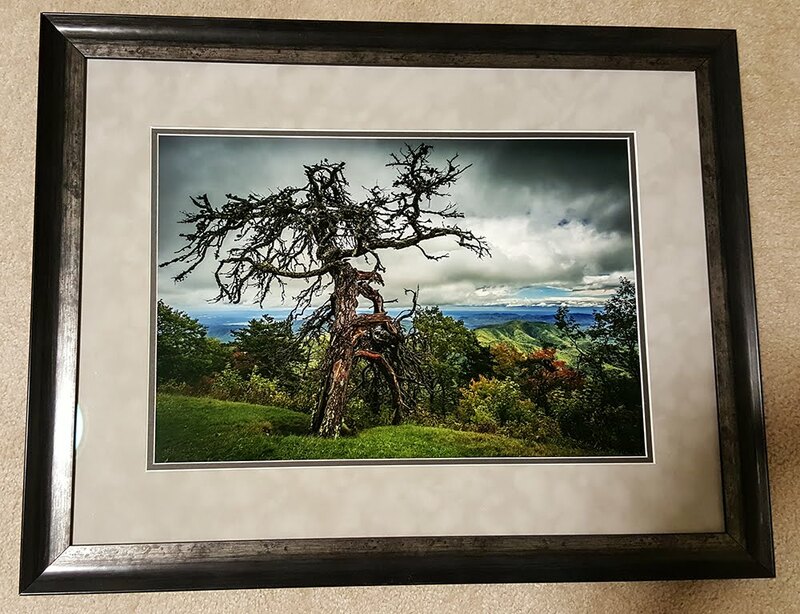 I decided to make the tree a supporting element to a much larger composition that also included the colorful trees in the background. 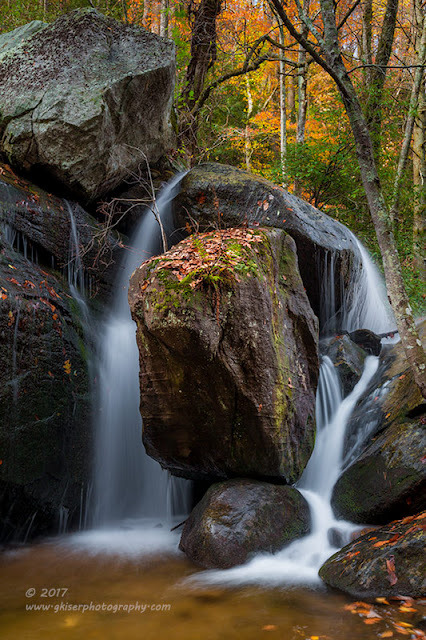 The foreground was made up of a medium sized cascade that flowed over the rocks and was slightly covered by the remains of a tree. The creek itself balanced out the foreground to the left with one additional small rapid that made for a left boarder. There is a lot going on with this picture, but it did encompass everything that I was "seeing" in the scene. As I was shooting the scene in front of me, I was a little surprised that the sun was starting to cause me problems. The landscape was bathed in nice and diffused light, but the sun was peeking out over the trees to my right and causing some lens flare issues. I was able to deal with it to a point by using my Boonie hat to shield the front element, but that was getting increasingly difficult. I abandoned that composition and moved to other elements that caught my eye. One of the areas that I started to focus on was a bunch of trees on the other side of the creek. I had enough reach with my current lens to grab an isolation, so I composed an image that anchored on a single trunk, but focused on a "Y" shaped tree in the background. 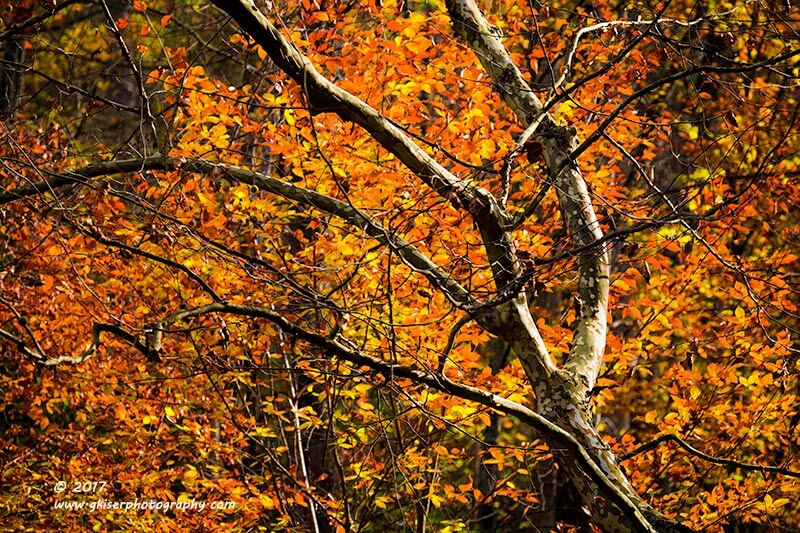 The whole idea behind this composition was to capture the colors in an abstract fashion. It went reasonably well. 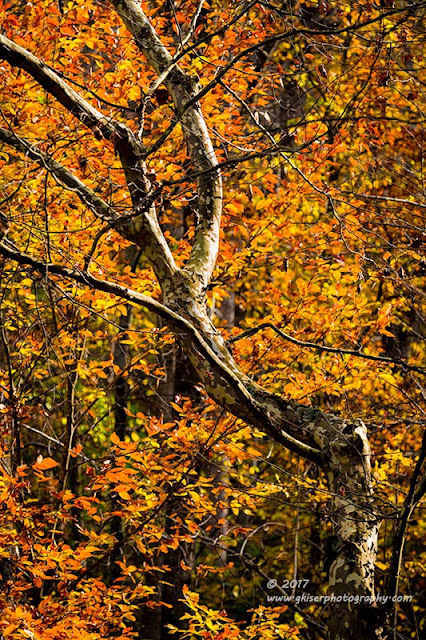 One thing about Fall is many of my compositional rules get thrown out the window. I am more interested in capturing the colors rather than doing things "right." That isn't to say that the images aren't carefully crafted, they are just a little more lenient when it comes to composition. They are more "fun" images to shoot, that is for sure. With the sun causing me problems I decided that it was time to move on. Funny thing is, I didn't even consider heading home. I just knew that the next section would have better light than this one. Again with that voice in my head. But you know what....it was right. The next water feature that I came across was in the shade, and the clouds had returned too. The lighting was great once again. Looking at the scene, I thought about shooting an intimate of the cascades, but I was remembering how well the first section had turned out incorporating the colorful trees above. I decided to give that a try first off. I kept the 24-70mm lens on the camera and started off with it in portrait orientation. I carefully composed the image to include the trees as well as the cascade. For a bit of depth, I opened it up to include the rocks on either side of the cascade. I moved side to side until I got the twin trees in the background to help balance the placement of the cascade. This was shaping up to be another one that I was excited about when I started looking at the LCD. I tell you what, this is now my favorite trip to South Mountains! I tried some more compositions on this section of cascades, but didn't really care for any of them after seeing how well the initial one turned out. It was time to move on down the trail though. I knew that the next stop would be some of my favorite cascades to work with. My gut was telling me that the light would be too harsh there with the sun climbing further into the sky. That voice in my head kept saying to continue on though. I'm not going to stop listening to it now, so I continued on. When I got to the boardwalk, I wasn't overly impressed with the scene in front of me. There wasn't much color to be had in the background, but the light was good. I decided to look for a composition. As I made my way around the first bend, I found a nice little curved tree with exposed roots at the base of a thin cascade. I could see some promise with that tree, so I looked for a composition. The only way I was going to get one that would work was to climb over the railing like I had done the last time I was here. Once I was on the ground, I looked at how things went together. I decided to leave my 24-70mm attached for this location since I was kind of close in. I started to hunt for compositions and decided to go simple to start with. I flipped the camera on its side and shot the first composition as a portrait shot. The curve of the tree was used to counter the slope of the rock to the right. The water gave a nice visual division between the two rocks. It was a good composition, but I knew that there was better to be had here. The composition that I was looking for actually had nothing at all to do with the tree. While it was nice, the odd way the rocks fit together and the way the water cascaded through them was what I was now fascinated by. 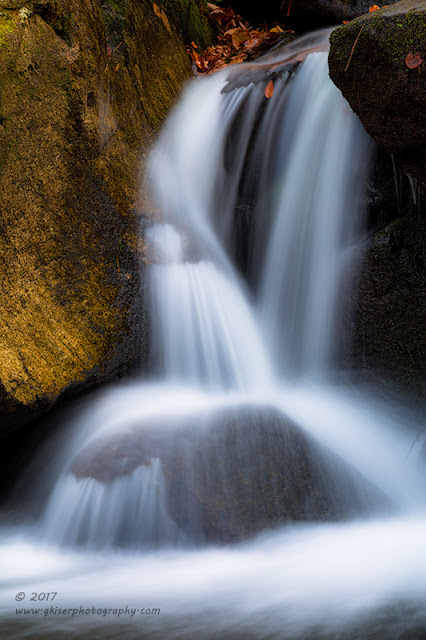 I altered my position once again, and framed a tight shot at the top of the cascade. The diagonals were striking and the water highlighted that fact. There was even a tree in the background that was able to be placed along the right third for a balancing element to the the terminal position of the cascade. This image was very much abstract, but I thought that it worked even better than the full image with the tree that had originally caught my attention. I was pretty much done with the section that had grabbed my attention, so I started to look around. I was looking at the section that I had photographed so successfully back in the early Summer and found that the lighting was better this time. I moved around on the rocks to get into a better position. I found myself wondering if I was going to slip and fall rock hopping with a full pack on my back and holding a camera on a tripod. I wasn't the poster child for grace, that's for sure. Somehow I managed to get into position on the rocks without hurting myself or my equipment. I framed up a shot that was different than what I shot last time. 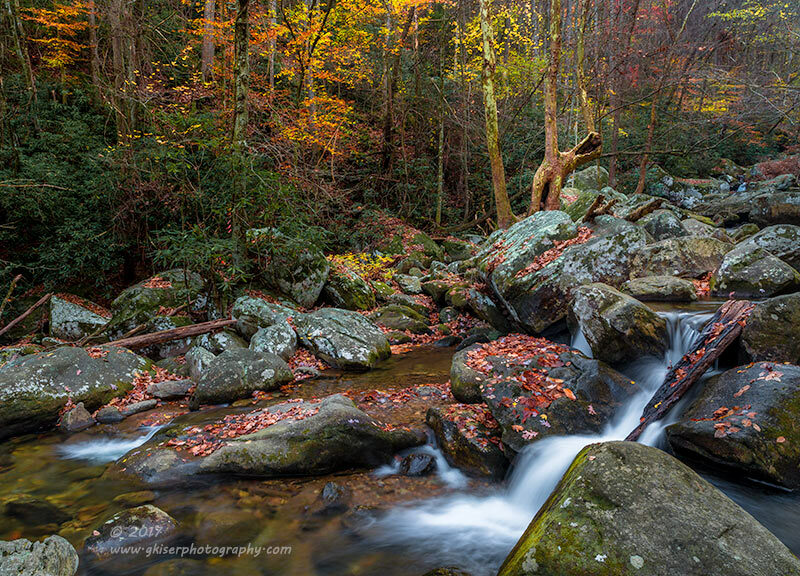 I chose a horizontal format to fully take advantage of the leaves on the rocks as my best shot for color. I tried a few different compositions from this precarious location before looking for my escape route. Wait a minute...the section that I had started photographing was now looking completely different from this angle, and I was liking it....a lot! I moved slightly from my position and found that sometimes you just have to walk with your left hand on the rock right beside your right foot in order to get to the next rock while using your tripod as a hiking pole. My footing was terrible, but I got into position for the composition I was already excited about. I got the composition put together just as it had been in my head. 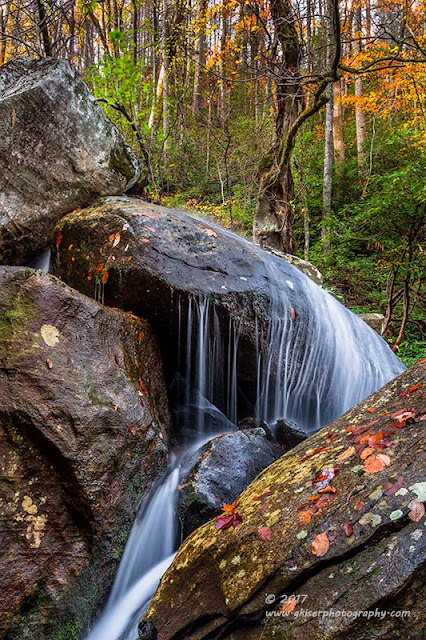 The one balancing rock was jutting out from the cascade like the head of a dinosaur. The cascades were framing it just perfectly. The rocks to the right and left framed the entire photograph. 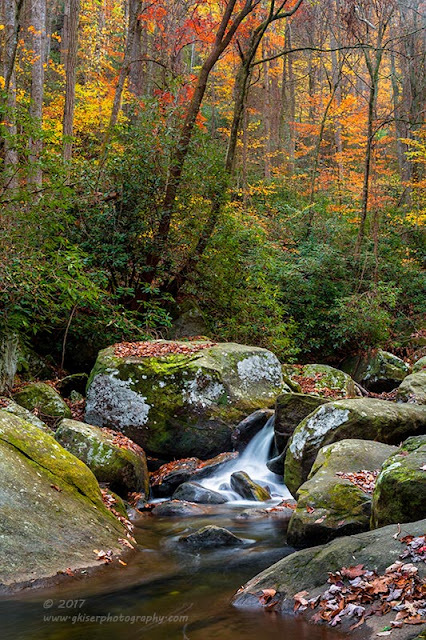 There was a patch of fall color in the background which was framed by two trees above the rocks. These trees were slightly curved and mimicked the cascades below for an unmistakable balance. Everything in this photograph just came together perfectly, and I could tell in the LCD that I had nailed the composition, the histogram showed a perfect exposure. I was happy! Once again I was pumped on this Trek. I was getting images that I had never seen before along this hike. That voice in the back of my head was so right about making me come out here today. I was getting some great images that I had overlooked so many times before, and the remaining leaves were really making things fantastic. Since I was in a new location on the rocks, I decided to look around and see what Else I could find. I went back to the section of the cascades to the left and found that I was elevated enough now to see a rock at the base with some leaves on it. I went ahead and moved the camera, and slowly rotated my own feet on a couple of rocks. I got an image formulated, and shot the composition that had sparked my attention. 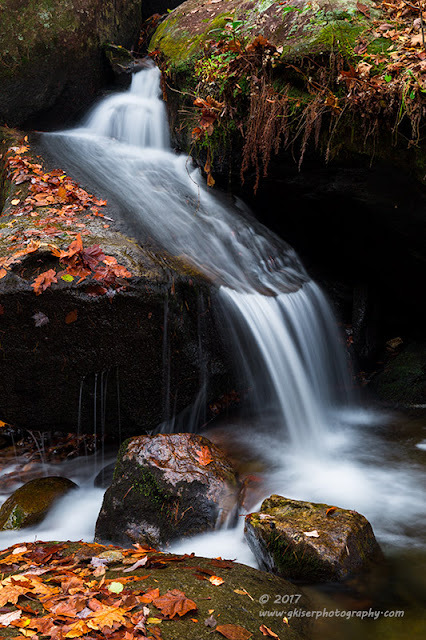 It was a simple image, and one that appealed to me because of how the water in the foreground seemed to be circling the rock as if to highlight it in the picture. While I was here, how about the other side of the cascade? Yep, there was a composition there as well. 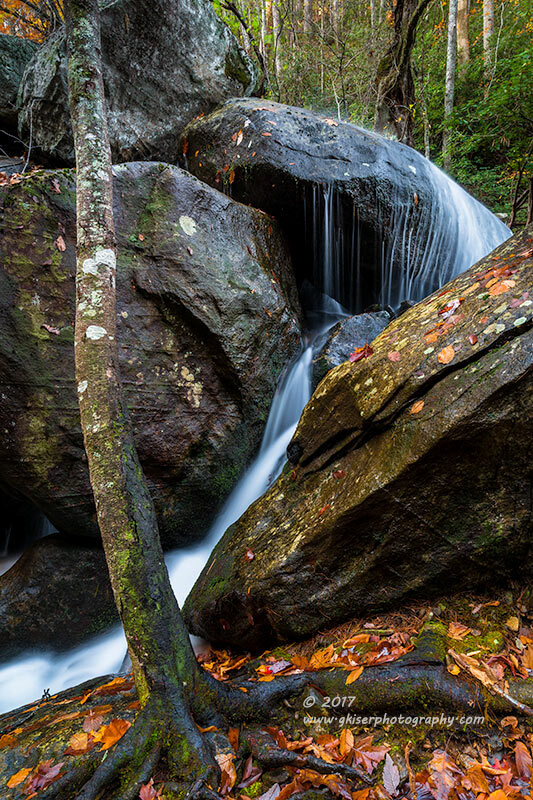 I went ahead and got the camera in position and composed a final image of this section of cascades. What I liked about this composition was that the rock in the lower left was a nice counter point to the mossy rock at the top right. The water made for a great diagonal off of the rock that had leaves on it which formed a bond with the rock in the foreground. Geometrically, this was a great image. There was just enough color in it to keep it quite interesting as well. With this composition shot, I decided that it was time to get off of the rocks. I had now been standing on the uneven surface for about a half hour now and my feet were getting sore and stiff...not to mention my calves. Consider this, in order to maintain balance, I was basically putting all the pressure on the balls of my feet...for that full 30 minutes. I was having a hard time making my legs and feet work to get back to the boardwalk, but I finally did. I climbed over it with most of my dignity in tact as well. Once on the boardwalk, I looked up the trail to the main falls, which I could see from where I was standing. I fully expected the voice in my head to say continue on to the main falls. To my surprise, the voice told me to turn back towards the parking lot. I didn't mind since I really don't like this waterfall and there are a lot of steps to get to to the viewing platform. As I came off of the boardwalk, I happened to see another section of water that looked kind of promising. I worked my way to the creek and set up my first composition. It was fair, but there wasn't anything special about it. I recomposed with the same results. My problem was...there was too much in the frame and I couldn't get any closer to the section I wanted to photograph. I ultimately decided to swap out lenses for my 70-200mm. This gave me the reach that I needed for what I was trying to get. I isolated a section of the cascade which had caught my attention. It turned out great in the LCD and it was one that I was planning on doing as a monochrome image when I got home. As it turned out though, I really liked the warm colors on the rock to the left and decided that it worked very well as a color image because of that rocky wall. 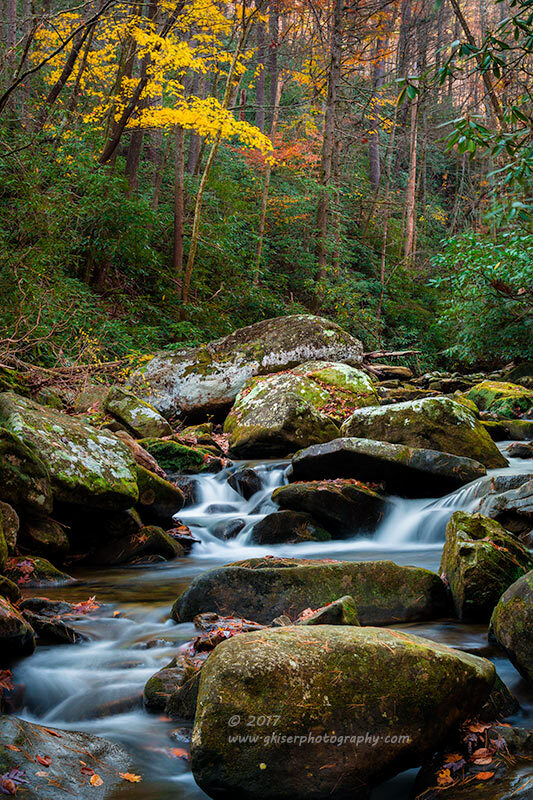 This one composition was all I got from this location and then it was back to the trail. I ended up passing by the one section with the yawning tree and stopped once again to see if there was anything that I could pick out with the long lens. Well, I happened to see an element that I had not seen before. This might be because the sun was now shining through the trees and highlighting areas that had been in the shade before. Regardless, I found a couple of compositions in the trees, and started to pick them out with the long lens and polarizer. 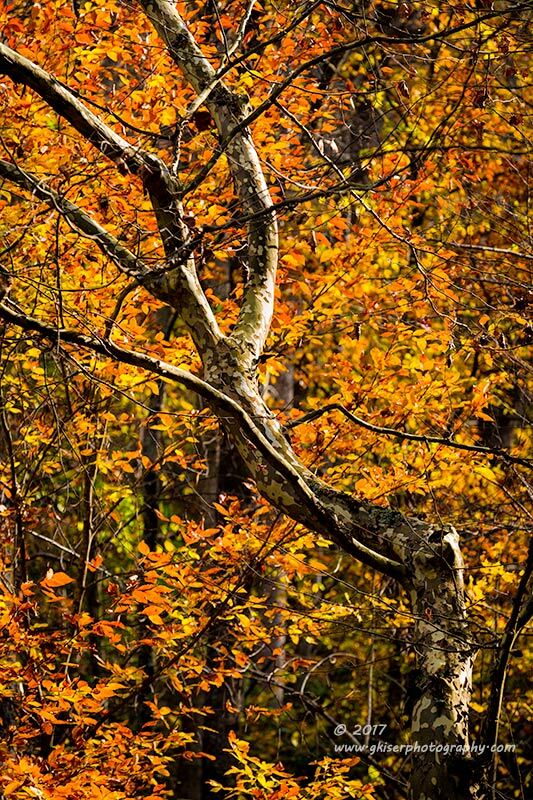 There was this one birch tree that really caught my eye as it was bathed in sunlight, and had some interesting bends to it, as well as branches that looked an awful lot like a hand. I had a lot of fun shooting this one. The trick was waiting for the wind to die down. By this time, the wind was really starting to be a problem. The forecast had been calling for 40mph gusts later in the day. It wasn't that bad, but it was bad enough to make shooting a still photograph difficult. As luck would have it, there was another fascinating tree to the left of the one that I had just shot. I panned the camera over about 30 feet and composed an image around this other tree. What really drew me to it was the symmetry of the branches, and how they tended to all work together. Of course the brilliant colors behind the tree didn't hurt either. I only shot two frames here because the wind was picking up and I was having a really hard time getting shots in between the gusts. I went ahead and found a nice level spot and broke the camera down to put it back in the bag. It had been a great day. I had shot nearly 130 images between Salem Lake this morning and South Mountain this afternoon. Considering I had not even really planned this day out, I had gotten some tremendous images and I was so glad that I had decided to take advantage of my bachelor day and go out with the camera. On a funny note, after I got the camera packed back up, I was walking down the trail and came across a Japanese Family that was sitting and resting. The husband had a Nikon camera around his neck and seemed to take interest in my gear. He looked at me and pointed as he said..."Anata no sankyaku ni mizu ga arimasu." Uh...OK, sure. I replied "Hi there". He again pointed and said something to the effect of "Anata wa sankyaku kara mizu ga tarete iru." He was now pointing to my tripod at the Manfrotto Logo. "Anata no sankyaku ga anata o murashimashita. Anata wa sono shizuku o miru koto ga dekimasen ka?" I could see the water dripping out of the top of the tripod and finally understood that he was telling me that my tripod was wet. It all made sense now. I said that it was OK that there was water coming out of it. I had been using it in water half way up the legs. As I was telling him that, I realized that he had no idea what I was saying. His response, a smile and a thumbs up. I'm sure he was thinking "What an idiot!" but at least he thought it with a smile. That pretty much wrapped up my day, and all that was left was the two hour drive home and the processing of the images. Again, it was a great day to be outside, and I had a blast at South Mountain. Originally, I was supposed to be working a traffic detail at work today. However, late in the week, we got word that there was going to be plenty of officers signed up for the job and my squad would not be needed. That opened up my Saturday. Add to that, Toni was working and Sierra was staying at a friend's house out of town. Everything was working in my favor for a great weekend of photography....that was except for the weather. What had originally been forecasted as a cloudy and stormy Saturday had turned into a clear and beautiful weekend. 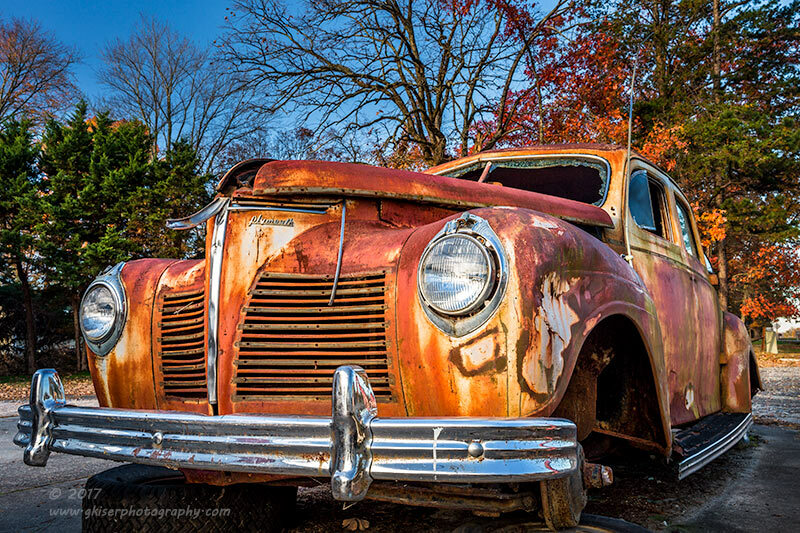 It was looking like I would not be going out for any pictures unless I decided to hunt old cars early in the morning. As Friday arrived, my mind was very much focused on photography, but not the landscape kind. 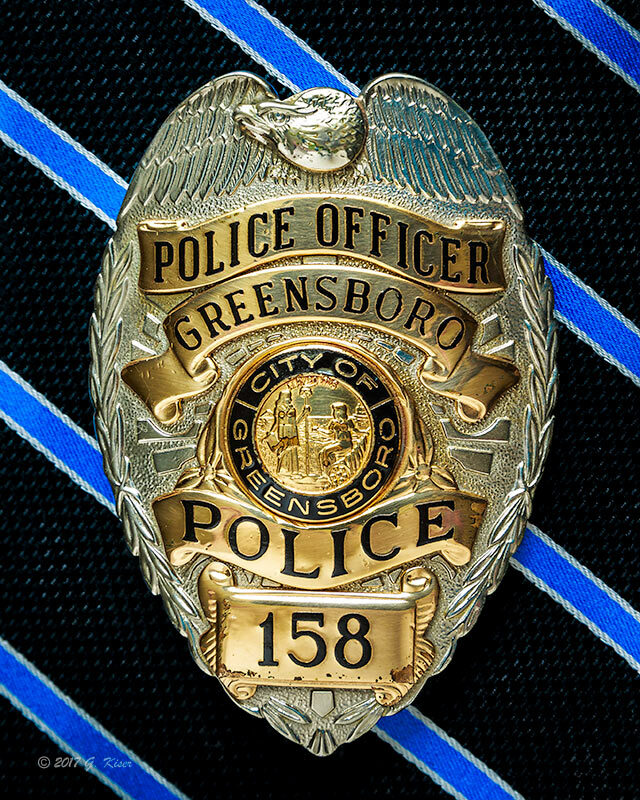 You see, my "Badge on Thin Blue Line" collection has been getting more and more popular and I was shooting the third and fourth badges of the week on Friday evening. I wasn't really thinking much about if I was going to be going out on Saturday or not. Before bed, I looked at the weather and saw that there was now going to be increasing clouds during the day with most of them being towards the mountains. I also checked the sunrise forecast and found that the majority of the state should see some nice color in the morning. The color faded the further to the mountains that you went though. I wanted to take advantage of the possibility of a great sunrise, and felt that my best option was to stay close to home. I have been wanting to shoot at Salem Lake's marina for some time now. it is positioned just about right for a sunrise shot with some nice leading lines. There has been construction going on though and that has kept me from going and trying it out. I have been keeping an eye on the status, and according to the Internet the construction was now pretty much finished. 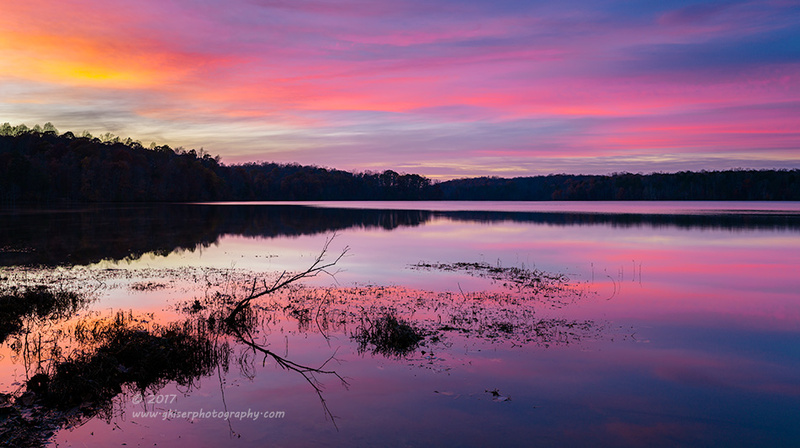 With the possibility of a good sunrise, I decided that now was as good a time as any to give Salem Lake a try. Fortunately, I didn't have to wake up too early to get there since I'm only about 15 minutes from the marina. I woke up with Toni left at 5, and was out the door by 6. That would give me plenty of time to park beyond the gate and walk in. As I got near the park though, I found that the road was still closed and I wouldn't be able to get there from here. Glad I left in plenty of time...I was pretty much going to have to go most of the way back home and go to the other side of the lake for access. Guess I should have checked road conditions, but the GPS was saying that the road was now open. Oh well...nothing that I can do about it but redirect myself. I arrived just as the light was hitting the sky which was still plenty of time to get set up. I walked past the gate and went down the road until I got to another gate that was prohibiting entry to the marina. Things just aren't going my way this morning. I could see a playground and picnic tables set up on the shore of the lake to my right and I was able to get to that section. I went ahead and walked over there to see what I could use for a foreground as the sky was already getting interesting. I found several trees that I wanted to use, but they were a little big, and I wasn't expecting enough color to really support that kind of wide angle. I thought about using a bench, but I didn't really care for that either. As I walked along the shore, I found some vegetation emerging from the water that had a slight "S curve" to it. This would be my foreground and leading line into the frame. I decided to use my 24-70mm lens and mounted my Lee Filter Holder in case I needed to add any grad filters. I composed my first shot and released the shutter. It was OK, but not great. I shifted the composition again, and shot another frame. Again, it was just not compelling. I tried a few other compositions and locations without any success. The color was really coming into the sky at this point so I was getting a little desperate. I really wanted to use the element in the water, but I just couldn't get the composition right. I decided to try and go a little wider without adding to the top or bottom of the composition. In order to do that, I was going to need to shoot a panorama. I flipped the camera on its side and shot a series of four shots. Judging by the histogram, I was a little overexposed on the bright side of the image, so I quickly did another sweep dialing back the exposure. That histogram looked much better. I wasn't sure how the composition was going to look, but I had high hope for it, and only hoped that the colors in the sky would come out in the photograph as I had seen them. With the second panorama shot, I was pretty much done as the color was fading and I couldn't find any other compositions to shoot. I could have walked around the seven mile trail and worked on finding more subjects to capture, but I just wasn't really feeling Salem Lake on that level. I was wanting to go to South Mountains where the clouds were supposed to be coming in shortly. The strange thing was, I really had no idea what I wanted to shoot there, but something was saying to go. I'll do a part 2 of this blog to cover that part of the Trek. When I got home, I looked through a couple dozen images from my sunrise shoot, and found that none of them really grabbed my attention. The first panorama was overexposed and I didn't think there was much need in processing it. The second one showed a great deal of promise though. After I got it stitched together and cropped, I was able to really start to work on pulling the color out of the sky. I'll be honest, this one took a little work to get right. However, after I got done, the image was true to what I had seen as the sun was coming up. The one thing that needed to be done was to flip the picture around so that it flowed better with the bright colors to the left. Everything faded off to the right as the eyes read. I only got a single image that I deemed as a keeper from this sunrise shoot, but that was fine by me. I was only really shooting one composition with several variations. I was happy to get one that looked this good when it was all said and done. It seems as though Fall has been hanging on for quite some time now. 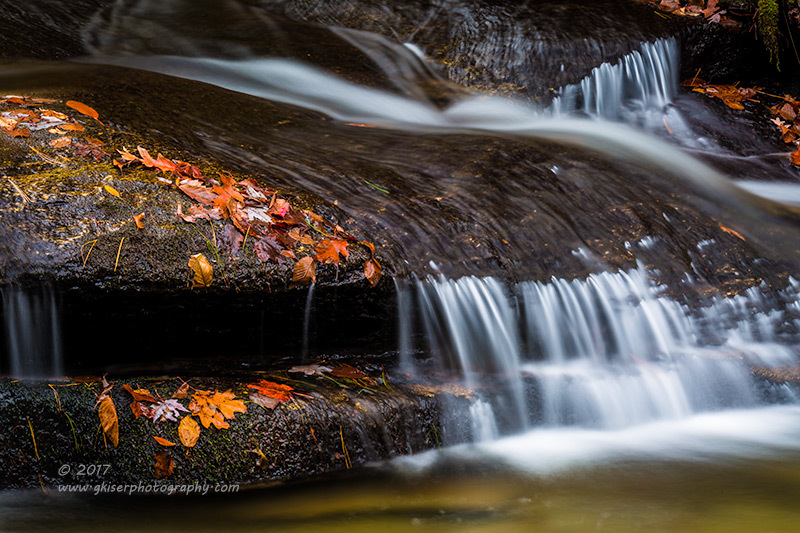 It was the middle of September when I ventured out to Graveyard Fields for the first bit of fall color. Since that time, we have seen warmer than average temperatures, some sudden drought conditions and just generally everything that could be thrown at the season to keep the leaves from changing like they were on track to do. The side benefit to that weather pattern, is that for the most part, the leaf season has been stretched out to over two months, which is rather nice. As we approach the middle of November, most of the state is well past peak, and there is just a little bit of color lingering for our enjoyment. Having been pretty much all over to catch the color, I decided to change it up a little bit today and I headed out to Stone Mountain. The last time I was there, I was shooting just one of the waterfalls, and there was just a hint of color in the park on that day. Obviously, I would have liked to have hit the leaves at peak color with this trek, but I knew I would be on the tail end of the leaves. It was fine by me though. I was going to have fun hiking and just decompressing for a little while. The intention was to shoot what the conditions called for. I was prepared to shoot waterfalls, woodland, and grand landscapes. it all just depended on what the clouds did. When I arrived at the park, I was a little disappointed at the lack of color in the leaves. I knew I was past peak, but I though that I would have a little more color than this to work with. Oh well, I had come out this far and I was going to make the best of it. Looking at the sky, the clouds were thick and they had no obvious texture to them. This meant that I wasn't going to mess with hiking up to the top to get grand landscapes. I was going to focus on woodland and white water scenes as that was what the light called for. 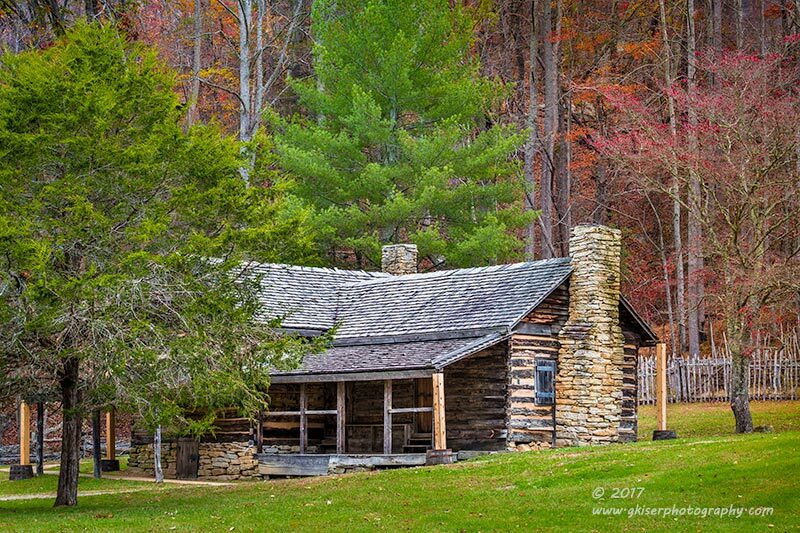 I set out on the trail to the Hutchinson Homestead and started to look for color in the trees. I didn't find any real color, but I did find an interesting tree that I have seen many times before. I've always wanted to photograph this tree, but it has proven difficult to get a composition with. I started to look around and see what I had to work with. 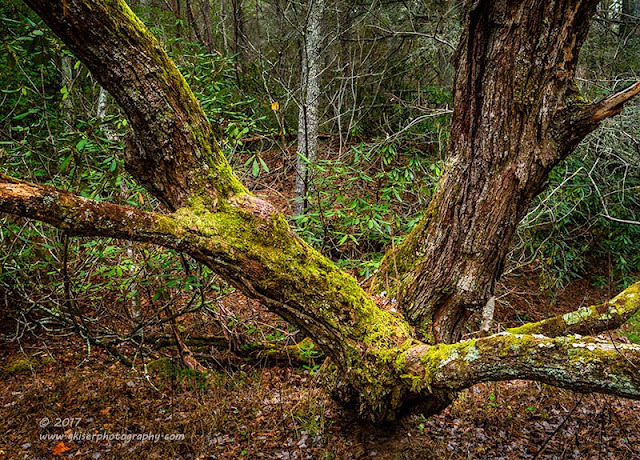 I really liked the way the trunk was shaped, and the moss on the tops of the main sections. In order to get everything that I liked about this tree, I was going to need to select a pretty wide focal length. I went ahead and fitted my 16-35mm lens with the Singh Ray Color Combo Polarizer. I got in close and started to work my way around the tree in order to find that perfect position. I'm not sure if I found it or not, but this is much closer than I have come before to getting it right. If nothing else, Toni likes it, and has expressed interest in using it for a project later on. I count that as a win! After I spent some quality time with the tree, I moved on down the road to the homestead. There were a number of people there looking at the exhibits, which made my task a little difficult. I had to exercise lots of patience waiting for people to move out of the frames before I released the shutter. It did give me plenty of time to fine tune the compositions before I actually shot the pictures. I was really happy that there was a little color in the background for me to use in the compositions. it wasn't much, but it did give a little extra visual interest to the pictures, and added a sense of season which I was after. For this particular subject, I swapped lenses and went with my 70-200mm lens so that I had a much better chance of excluding the sky which was pretty much a blanket of white above. I kept the Color Combo Polarizer on this lens to help extract as much color out of the scene as possible. One thing that I have been rather sad about for a while now is that the tree that used to make for a great foreground was no longer there. It was cut down several years ago. I really hate that happened because the odd shaped tree made a wonderful element to any composition of this old house. Now, the stump will have to serve as a foreground element. It is still effective, but not nearly as interesting. The trick here is to position the one tree to the left in front of the display that tells about the home. By covering that, this looks much less like a museum piece and more like an old cabin at the base of the mountain. Since that was what I was going for, the composition was quite important. As I was working the old cabin, I started to get interested in the lines that I saw by the chimney. 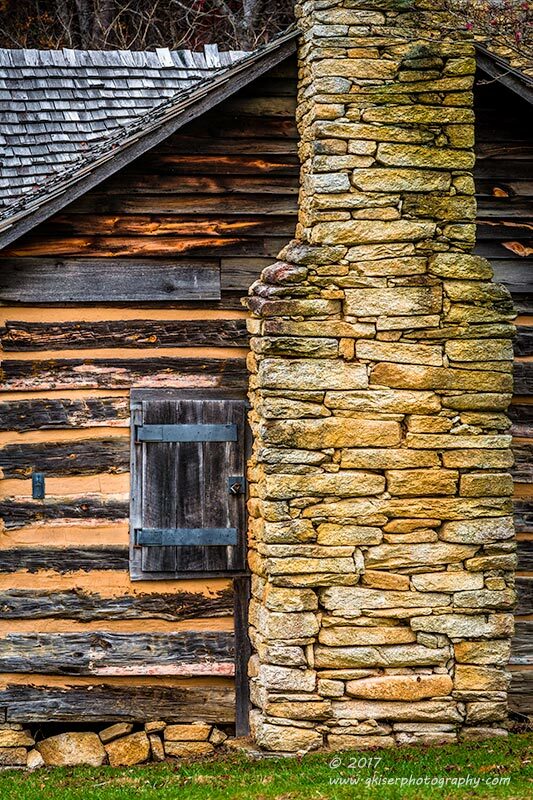 There was some nice old stonework set next to wooden planks. The shutter over the window was vertical and made for a great contrasting element to the siding. The roof line was diagonal, which mirrored the step on the chimney. 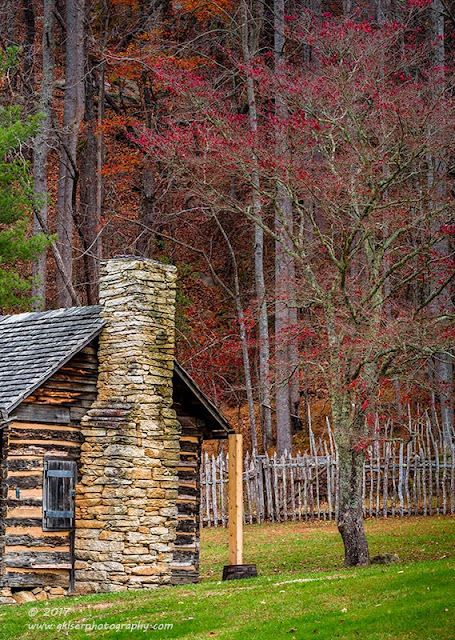 The shingles on the other section of roof gave a counter element to the chimney. I was on to something with this isolation of the old cabin. The warm colors were just the icing on top of the already tasty cake. Unfortunately, as I was getting into the groove of photographing this old cabin, more and more people started to come in. I was starting to have a terrible time making compositions that didn't include people, so I decided to move on to another location and see what else I could work with. 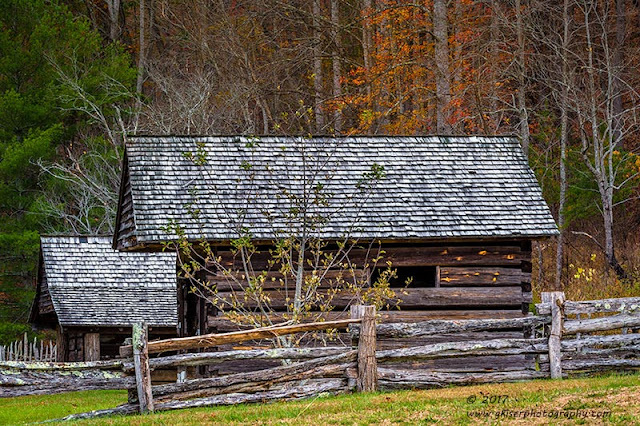 I made my way just outside of the old homestead and found that the split rail fence really caught my eye. I was able to get a composition that included the fence, a pair of barns and just a taste of fall color behind the barns. It was more or less a postcard shot, but I was kind of liking it. It captured the feel of the scene, and had a certain timeless quality to it. The composition was also dependent on two different issues. The first was people that were sitting just to the left of the frame, and the display that was right there with them. I had to crop in tighter than I would have liked on the left in order to get the shot. Having had enough with people, I abandoned any further attempts at photographing the homestead. 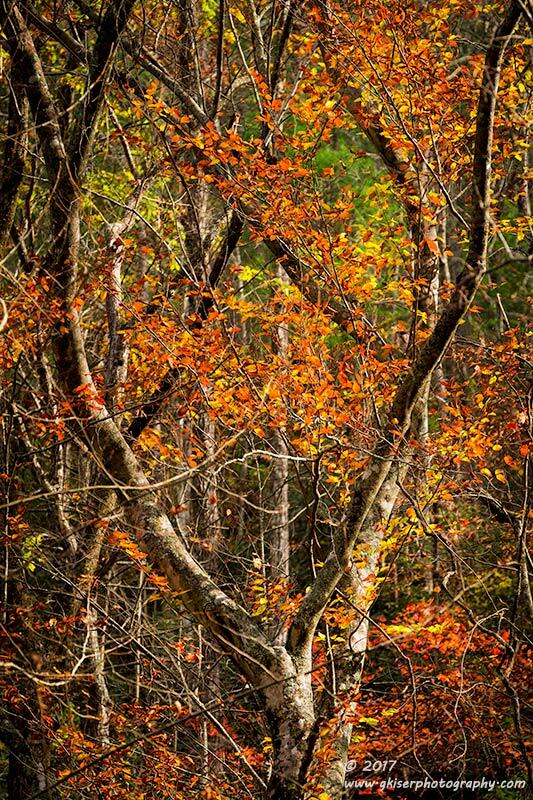 I decided to move on though the meadow to find fall color and some woodland images. The sky was still not doing me any favors so I was content leaving my long lens on and searching for isolations. I happened to find just what I was looking for at the base of Stone Mountain. 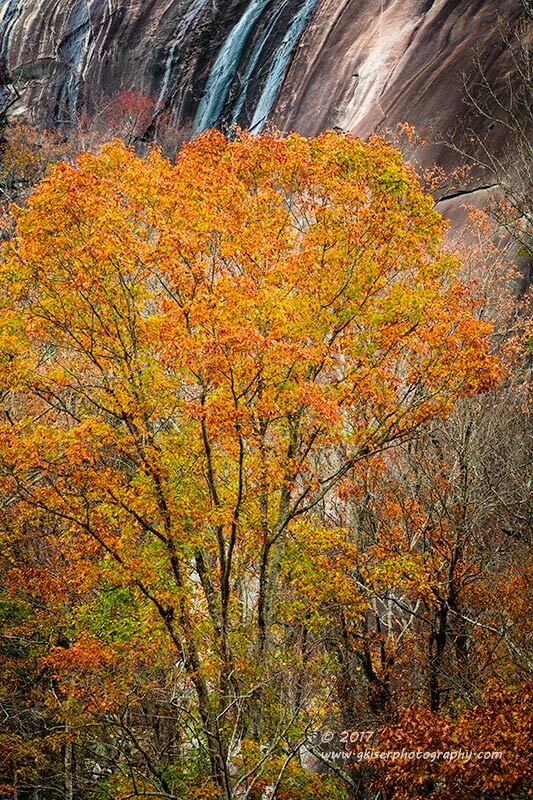 There was a tree with some brilliant orange leaves that stood out. I liked the trunk system as well and the background of the bald really pulled it all together. This started to set the tone for me when it came to finding color. There were trees here and there that had some great color, and I was going to pick them out one by one if I could. I continued through the meadow and went to my favorite little pocket at the end. It is here that I have found some really nice trees to work with. One of my favorites didn't disappoint today. 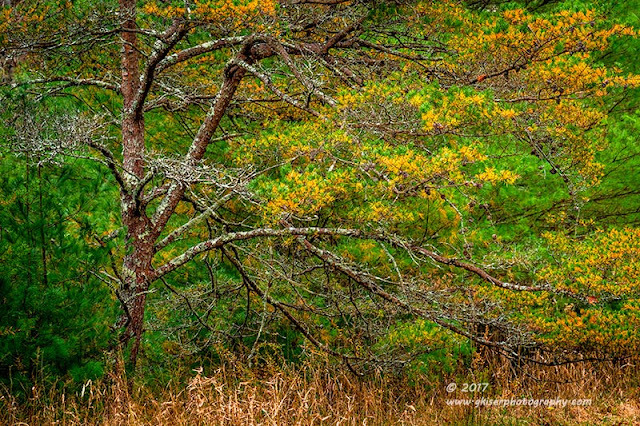 The swooping branches were still just as alive as ever, and the rich greens were joined by some golden tones which added a nice sense of season to the image. The brown grasses below also helped with the color pallet in the composition. 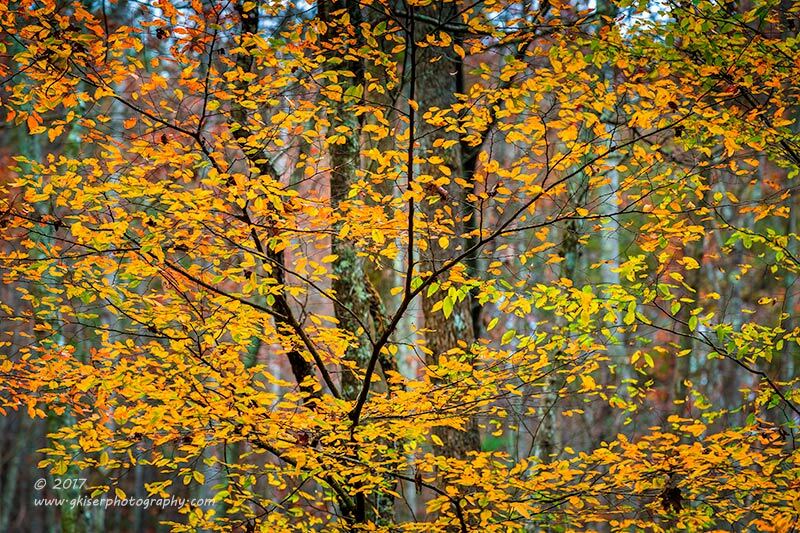 The change of seasons is always so much fun to do woodland images because of the different colors that are on tap at almost any given location. The only trick is to find where these colors make sense and have some sort of visual anchor to rest the eyes on. After about 2 hours in the park, I decided it was time to actually hit a trail and start working my way to the water. In order to be a little more likely to try compositions, I left the camera built with the long lens and polarizer attached. I started to make my way through the lower section of the Stone Mountain loop. I wasn't really finding much that caught my eye though. The water levels were low, so the stream was a little boring. Even areas that I have photographed many times before lacked anything special this time. I had been excited about the controlled burn that they did earlier as it will cut down on the underbrush quite nicely, but I just couldn't find anything at all to photograph. Then, off in the distance, I saw a vibrant yellow tree up high. I got closer to it and realized that there was only one direction that I could shoot the tree without getting any other trees in the frame. The section I was after was up about 40 fee or so. I positioned myself so that I could shoot up that high without getting the sky in the composition I used the delicate tree trunk as a visual anchor for the image. Because of that, I started out with the camera in portrait orientation to accentuate the arch in the wood. Wanting to take advantage of the abstract qualities of the leaves, I flipped the camera back on the horizontal axis and recomposed another image. It was not nearly as strong of a composition, but the abstract quality was worth the frame. There was a slight haze in the distance that I was able to accentuate with the limited depth of field. The background was just a blur of color and shape beyond the golden leaves. It wasn't perfect, but it was setting the tone for the rest of the hike. I was going to be working some abstract scenes where I could find them. As it turned out, the abstract scenes that I was going to be shooting for the next little bit had nothing at all to do with the leaves. The deeper I got into the trail, the less leaves I found in the trees. I started to look lower for inspiration. Oddly enough, the water levels were looking pretty good as I got closer to the main waterfall of the park. I started to pay attention to the sections of white water as I found them. One such section I had tried to photograph before with absolutely no success. I recalled trying to take it all in with my 24-70mm lens and ended up with nothing worth keeping. This time, I was in a mindset to isolate sections of the landscape, and this was looking like a good place to do just that. I wasn't able to get downstream on the best section of this bit of rapids, but I was able to shoot down on it from upstream. Looking at what I had to work with, I decided that shooting an abstract would be the way to go for this one. I zoomed in tight on a section of rock that had some nice cascades rolling off it, and surrounded it in a sea of cloudy mist. I included one rock that was above the water level to give a nice visual anchor. 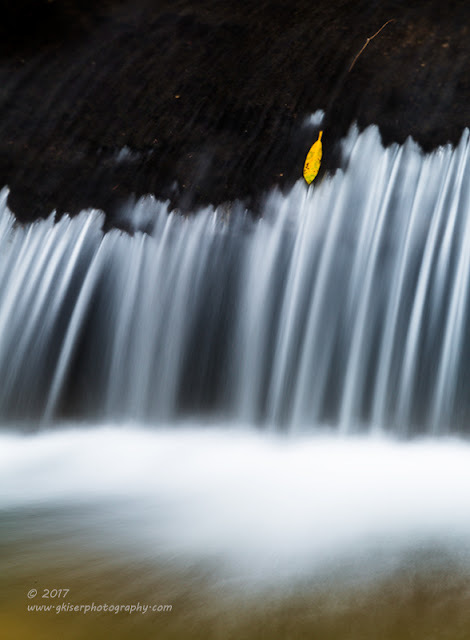 I dialed in a five second shutter speed in order to really blur the water. The resulting image was pretty good, but I wanted to get it in even closer than this. I flipped the camera over on its side and zoomed in even tighter. This image had less visual clues as to what you were looking at, and was even more abstract. 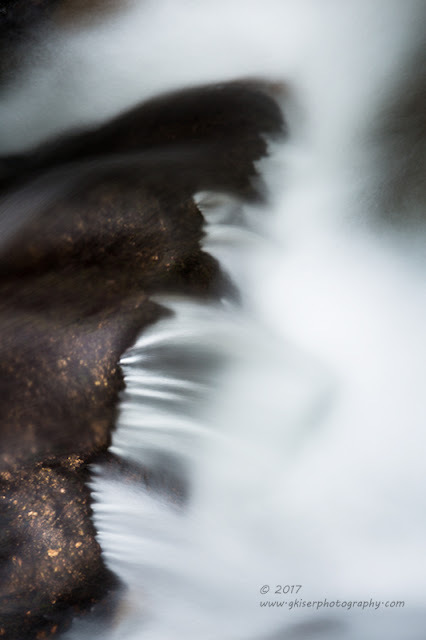 There was a definite dreamy quality to it with most of the image being the blurred water. 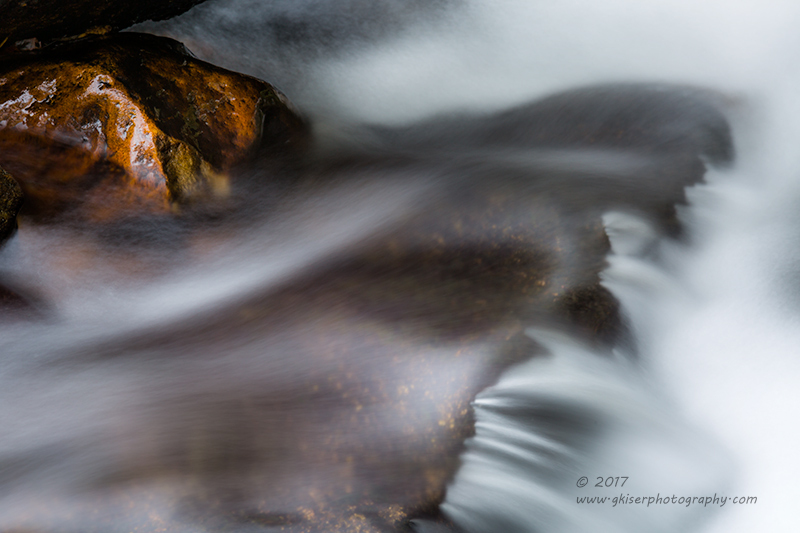 Having the water flowing at this angle looks odd to me, but fits with the abstract qualities of the image that I was going for. Since this wasn't the only section that was worth a picture, I redirected my attention to the other side of me for a more expected composition. The other side didn't have that much water, but what it lacked in water, it made up for in splashes of color. 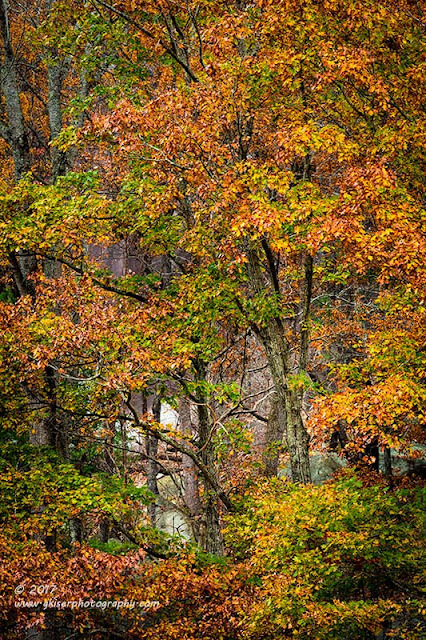 There was a rock that was nearly covered in golden leaves which made a great focal point. There was also a nice touch of greenery on a rock in the background. 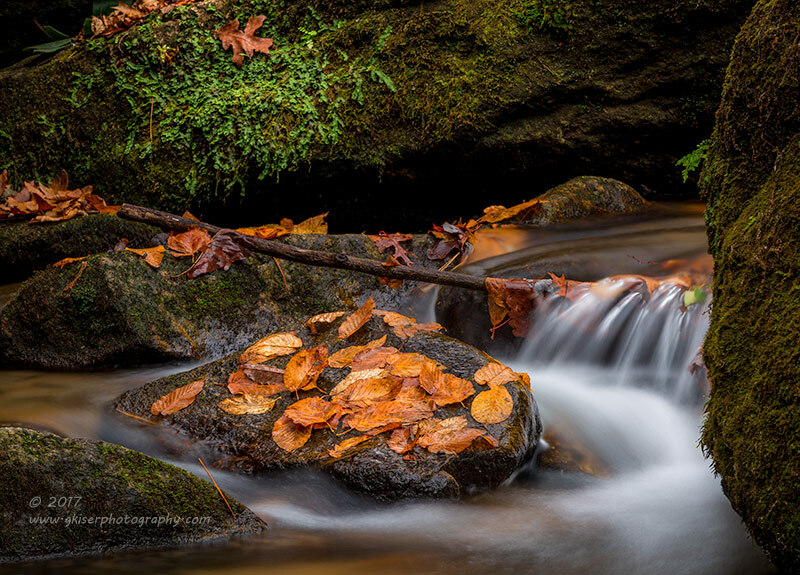 The water just provided a nice sweeping frame for the leaves in the foreground. This composition is less about the water and more about the season and the wonderful lighting that I had to work with. It took a little doing to get this composition though. I tried different variations, some of which included another set of cascades below this one. 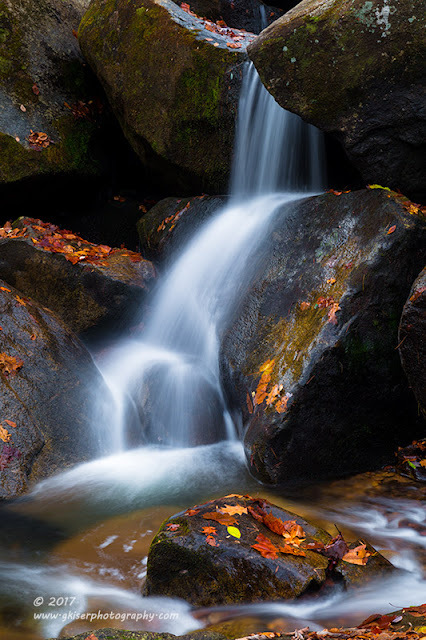 None were as pleasing as this one that really focused on the leaves covering the rock. Once I started to feel like I was forcing the compositions, I decided to move on down the trail. I didn't find any more colorful trees, but I did come upon a very interesting set of cascades that I had seen several times before. I had even tried to photograph it a few times with no success. Today, the water flow was different and it really looked promising. Since I had my long lens on, I decided to try picking out compositions instead of photographing the entire thing as I had done in the past. 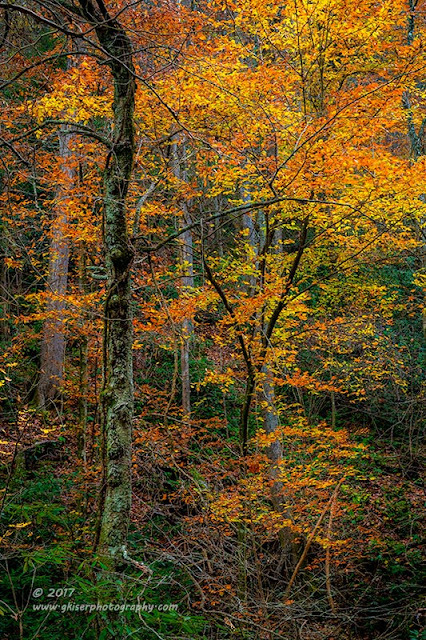 As with in the previous cascade, I really liked the orange leaves that were scattered about. They gave the scene some much needed color, and even a bit of texture. The water was magnificent though and had great flow. 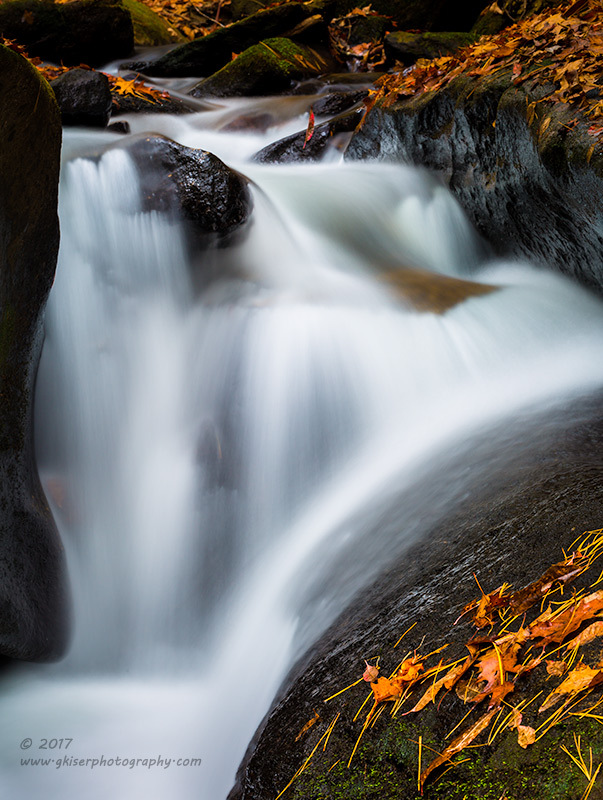 I was able to get the shutter speed to between eight and ten seconds which was about perfect for the flow I was seeing. It became all about getting the right composition at that point which was not the easiest thing to do because of the way the rocks were. 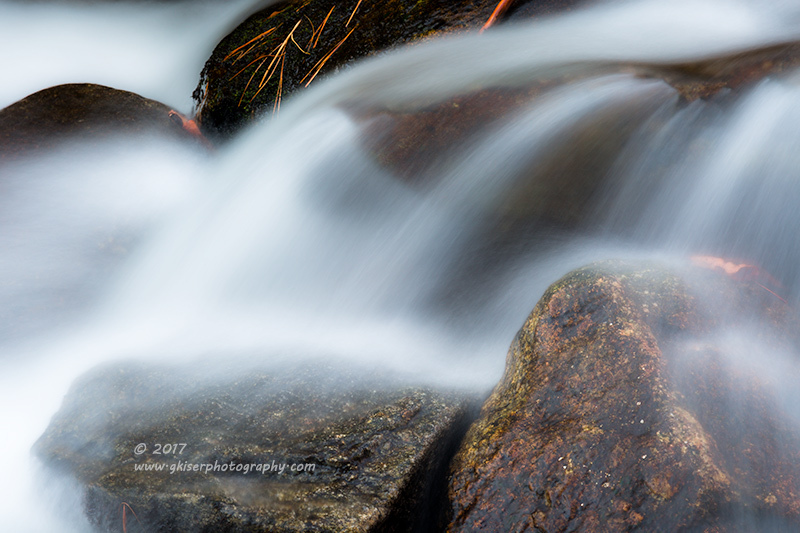 However, by getting in tight, I was able to capture meaningful compositions that told the story of this little cascade. The part that really caught my eyes was the section to the left under the "snout" as Toni called it. There was so much detail in the water, and you could just pick out each and ever layer to the rocks beneath the water. It was just so dang soothing to watch. I flipped the camera over on its side and put a composition together that would highlight just that part of the cascades. The depth of this image was just remarkable with the leaves in the foreground and the background continuing with that theme. The dark and light elements played so nicely together as well. I decided that after getting a handful of shots from here, I had better get back to solid footing. There is nothing quite so slick as wet rock with leaves on it. This was what I was standing on, and it was a slope at that. In the interest in not crashing the camera, I went ahead and got back up the hill to the trail. I continued on to the main falls, but not before passing a long section of cascades that I had photographed a couple of times before. There was a couple leaving that section so I decided to not rush them and I continued on to the main falls. When I got there, they were just as boring as I remembered. There just isn't much I care to do with a large waterslide like Stone Mountain Falls. There was no interest at the base either. The couple had caught up with me, and I think we were all coming to the same conclusion that there wasn't much to see here as we all started our way back down the trail. The stairs to the top of the waterfall had been damaged during a controlled burn and that section of the trail was closed. I made it a point to stop off at the small cascades that I had skipped a few minutes before. I got down into the water and started look for compositions. There wasn't much there as foreground interest was scarce. I did like a single yellow leaf that was stuck under the water just above the cascades. This was the first composition that I started to work with. It wasn't all that spectacular, but I liked the simple splash of color. From there, I started to look for other compositions. One section that caught my eye was a double layered cascade with additional cascades above it. I went ahead and framed that shot using the fallen leaves as my foreground interest and splash of color. The design of this was a bit abstract and it took a little doing to get it to flow right. In the end, I had a composition that I liked pretty well, and one of the few from this section that I really thought stood apart. It wasn't until I started looking for my next composition that I came upon something truly special. This is a short waterfall, but very wide as it stretches across the width of the stream. As I was looking for my next composition, it hit me like a ton of bricks. This was a panorama if I had ever seen one. I went ahead and leveled the tripod. I pulled the lens out to 70mm and swept the scene to make sure that I had the sweep level. I dialed in the exposure and set my borders before I made a six shot sweep of the scene. From what I could see, it looked really good in the individual frames. I had no way of knowing just how well it turned out until I got home and got the images stitched together. When I saw it, I knew I had something special...so much better than anything else I had shot here before. Now that my feet were starting to get cold from standing in the water, I decided it was time to head back to the car. I had been out here nearly four hours at this point and needed to get home. I left the camera out just in case I found some more compositions along the way though. As luck would have it, I found nothing at all on the hike back. It wasn't until I reached the base of Stone Mountain that I started to see other possibilities once again. 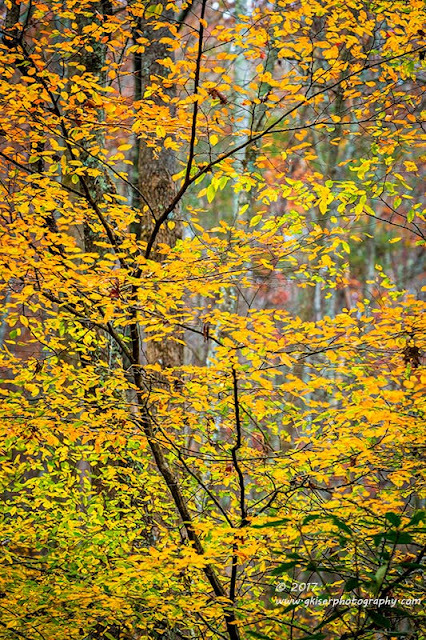 Going back to my abstract photos from before, I started to find pockets of color at the base of the mountain. There was this one section that caught my eye, and you could actually see through the center part. It was not my normal composition, but one that I wanted to give a try. 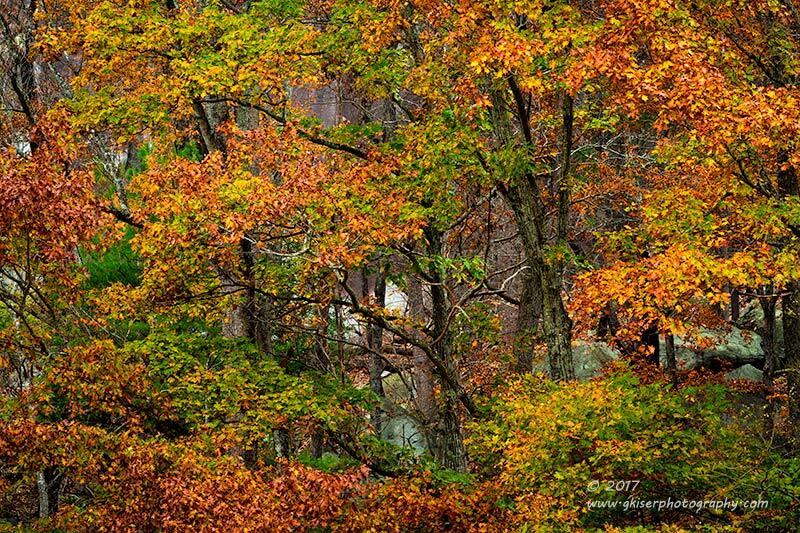 I started out with the camera horizontal as that gave the best abstract framing to the trees. I also wanted to get a little more specific with the trees, so I flipped the camera for a portrait shot of the same scene. The vertical composition was quite a bit stronger, but I actually liked both of them equally as well. It is probably my last hoorah for Fall this year as the leaves are quickly falling and I have a long week ahead of me at work. I might be able to squeeze in one more Fall trek, but I'm not holding my breath for it. As it is, I'm quite happy with my day. I've got 20 new additions out of 128 frames shot. I really can't complain about that at all. In fact, I wish there had been less as the time is now 10:46pm and I am needing to go to sleep so that I can get to work in the morning. Ahh, the benefits to having two jobs that both take a lot of time. At least I enjoy this one!